Deborah Williamson is a fully qualified Cognitive Hypnotherapist and NLP practitioner. She is a passionate and dedicated therapist with a great talent for helping people to bring about positive changes in their lives. Deborah also runs training in Mindfulness and Meditation and regularly facilitates groups and one-to-one tuition for relaxation and stress management. She runs a support group for Parents and Carers of children with disabilities and works with those affected by substance misuse on projects that aspire and support 12 step recovery programs. 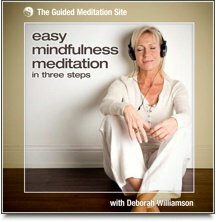 Deborah is a valued member at The Guided Meditation Site and we are particularly glad to share her expertise in the field of Mindfulness training with you. This easy 3 step guide is practical and clear, and will quickly help you get started with your own daily practice of mindfulness meditation. You'll learn great techniques that will help you to de-clutter your mind, relieve stress and so much more. Mindfulness meditation is the key to living calmly in the present moment.